Lone Star Shopper: Sock Club Review, April 2016 + FREE Pair of Socks! 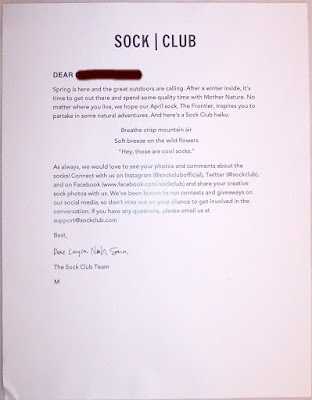 Sock Club Review, April 2016 + FREE Pair of Socks! 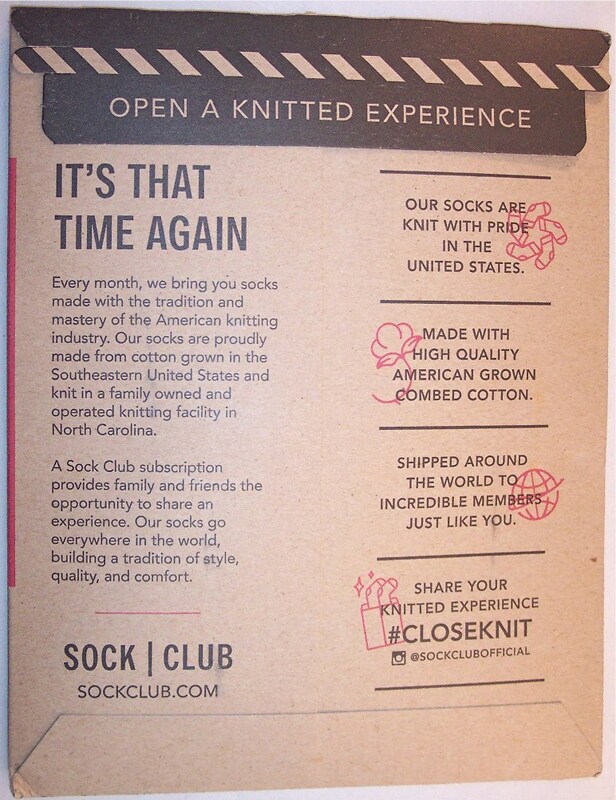 A couple of months ago, there was a Gilt City deal for Sock Club....$25 for a three month subscription. Since the price is normally $12 per month, this was a pretty attractive buy. 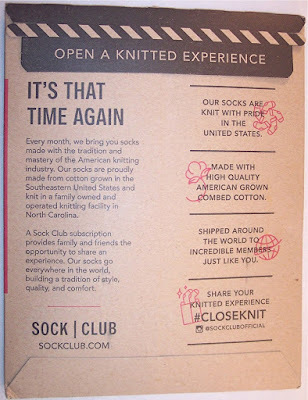 There are a lot of sock subscription services out there but what differentiates Sock Club is that their socks are made from cotton grown and knit in the U.S.A. That (plus their really cool designs) influenced me to give them a try. 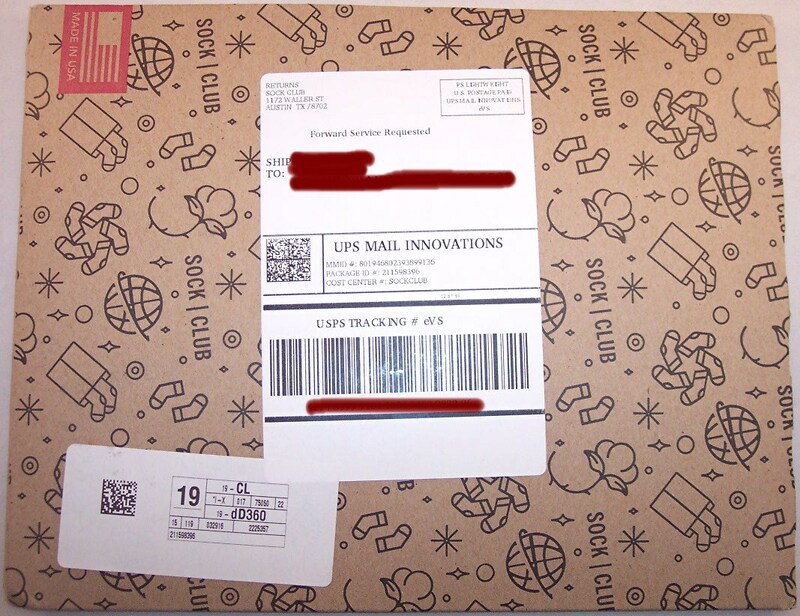 Sock Club socks arrive in a brown cardboard mailer with a cute logo print pattern. On the back is more information about Sock Club. Sock Club is operated out of Austin, TX and they design a unique pair of socks for their subscribers each month. The enclosed letter tells about the inspiration for their April sock, which is called "The Frontier". 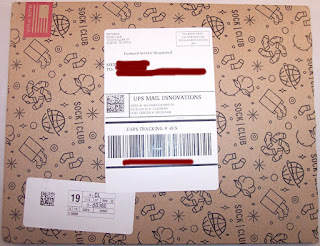 The socks are packaged in brown paper with a cool red wax Sock Club logo seal. And here are "The Frontier" socks! The bottom half is an earthy green shade with argyle "mountains" in tan and brown, topped with white "snow" and ever deeper layers of blue skies above. A yellow sun hangs suspended in the sky on each sock. Very clever and creative design! When setting up a subscription, you can choose whether the socks are a gift or for yourself and the size you need. I believe the designs are pretty much unisex so everybody gets the same design each month. These are a size Medium, which fits a Men's shoe size 8-12 or a Women's shoe size 9-12. Designs from past months are featured on the site and you can purchase them a la carte for $14. I really like "The Leo" which I received last month and "The Homesteader" which they featured in October, 2015. Sock it to yourself with this fun subscription! P.S. For those of you in Austin or San Francisco, Sock Club has some really cool skyline designs for your cities! I hope they continue that trend with some other locations. Been a member for three years and love the first of every month when I see the new feet clothes.